For the third year in a row, Quail Lodge & Golf Club has been awarded "Best Playing Conditions" for all of Central California by GreensKeeper (2016-2018). 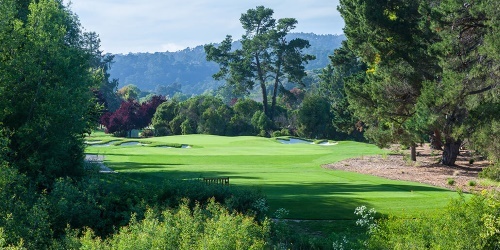 Known for its play-ability, pristine conditions and beautifully manicured greens, our Monterey peninsula golf course was originally designed by Robert Muir Graves in 1964 and refined in 2015 by principle designer Todd Eckenrode of Origins Golf Design. The recently enhanced 6,500 yard, par-71 Carmel Valley golf course is perfect for the walking golfer of all ages and skill, offering just enough bite to make it interesting. Our lodge features 93 spacious California-ranch designed guestrooms and suites, delicious farm-to-fork dining options, year-round outdoor heated swimming pool, dedicated wellness center for fitness and relaxation massages and most importantly mild temperatures and California blue skies nearly year-round. 1 night stay with 1 round of golf starting at $309.00. 2 night stay with 2 rounds of golf starting at $619.00. to learn more, please contact Nick Del Pozzo by phone at 831.620.8868 or by email at nickdelpozzo@quaillodge.com. For groups of 16 golfers or more, please contact Eric Smith by phone at 831.620.8882 or by email at ericsmith@quaillodge.com. When calling 831.620.8868 , please mention you saw this golf package on CaGolf.com and mention promo code: CAGolf.com. Quail Lodge & Golf Club reserves the right to change price and offer at anytime. Prices and offer are subject to change without notice. CaGolf.com is not responsible for errors posted in this golf package.